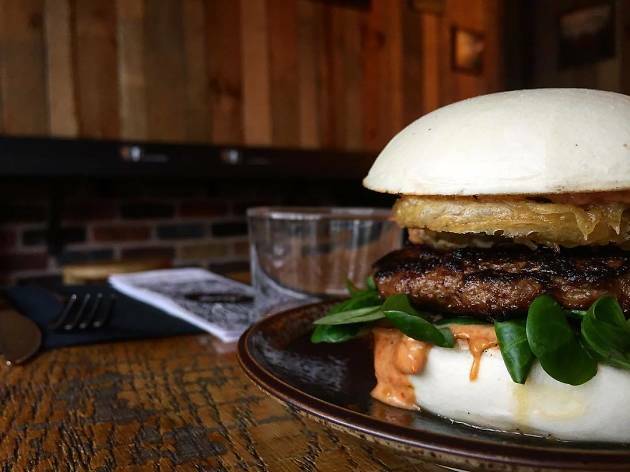 The Bao Burger should be incentive enough to drop in on this great little café, perhaps after a walk along the equally trendy Canal Saint-Martin (where Siseng has elected to set up shop, naturally). Furnished with hefty wood tables, a brick bar and a wall-length panel of windows overlooking the canal’s banks, the restaurant could not be better situated. Its den-like interior also boasts an alluring ‘fusion’ of cultural sensibilities: a skateboard bearing the image of Bruce Lee is propped up behind the bar, a cartoonish motif of flowers and mushrooms creeps up one wall, while a massive Chinese root carving is suspended from the ceiling amidst bare bulbs. For food, you can expect well-presented, savoury Asian dishes, burgers first and foremost, but also tempura (€6), spring rolls (€7), bo bun and tom kha kai (€12). For drinks, Asian beers (around €7), cocktails (between €10 and €14), as well as homemade soft drinks (€5-€7.50). We could quibble over the pricing (a tad too high) or over the consistency of the sweet potato fries (a little limp), but it would take a real effort not to appreciate Siseng. First, because the staff is friendly and attentive despite the restaurant’s being full to capacity every night. Second, and more importantly, because the food truly hits its mark. Flavors are perfectly balanced to create dishes that are somehow just right. The Bao Chicken Burger is a thing of beauty: panko-crusted (Japanese-style), topped with homemade coleslaw, marinated peppers and a coconut milk and basil sauce. Not to mention the wonderfully executed tempura, which includes green beans and baby mushrooms. Proof positive that a restaurant can be hip and playful without sacrificing flavour. 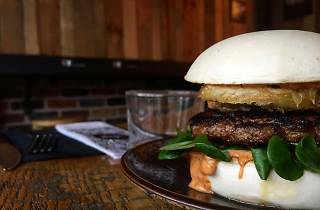 You can't help but love Siseng for their delicious bao burgers, their exotic and refreshing cocktails and their cool hipster vibe. You might have to wait a while to be seated (as there's always a line-up outside this restaurant along the canal) but the bao burger Kai (crispy chicken breast) alone is worth this slight inconvenience! The Siseng cocktail with gin, lemon, kumquat, lime, coriander and ginger ale is my favorite drink on the menu but they have lots of tempting non-alcoholic choices too! This is creative and tasty Asian fusion cuisine at its finest! The decor and overall trendy but friendly atmosphere (awesome waiters!) are two additional reasons why I keep coming back for more!